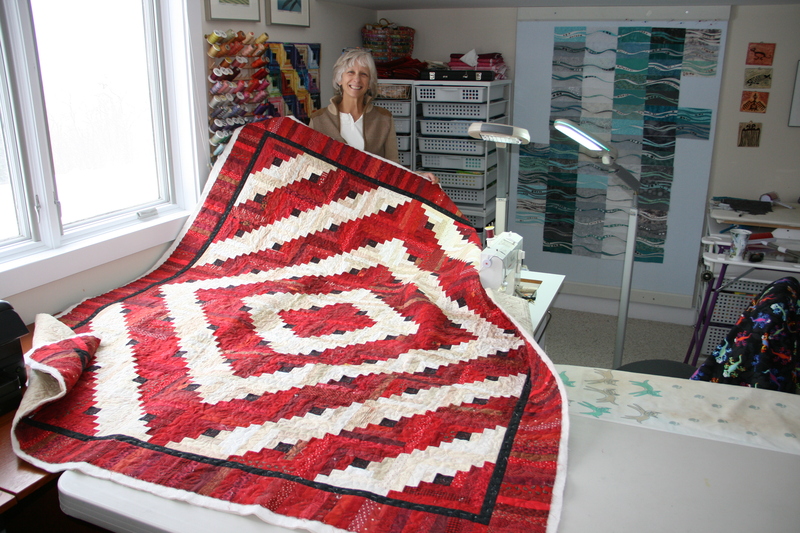 Welcome to my world of sewing and quilting! Ignorance is bliss….I never knew that piecing curves was supposed to be difficult. I just started doing it and then realized that I could topstitch the curves instead and it was actually FUN! 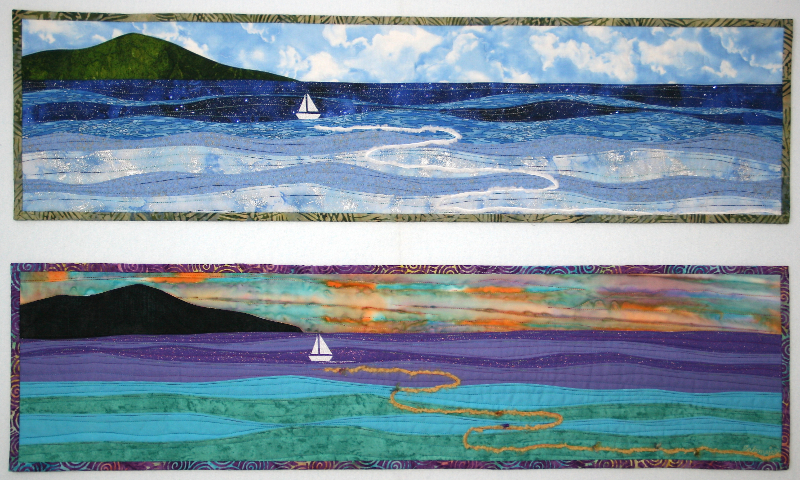 I love to share this playful attitude toward topstitched curves and how to use them….especially in landscapes (Accidental Landscapes), clothing (Wearable Waves), abstract designs, home decorations, traditional quilt blocks (Layered Waves), and so much more. What can be more fun than topstitched curves? Well…not more fun, but equally inspiring. How about raw-edge collage? That’s the other technique I love to play with and teach in my Happy Villages workshops. Please visit my website for more information and inspiration on both techniques. While you are there check out the new additions to the Student Galleries. Row by Row H2O June 21 – Sept. 8, 2015. Have you heard about the Row by Row Experience? It’s a great quilt Shop Hop experience, where you can pick up a free pattern at each of the shops to create a quilt, literally row by row . Super prizes are offered for customers who finish their quilts and bring them back to the store. 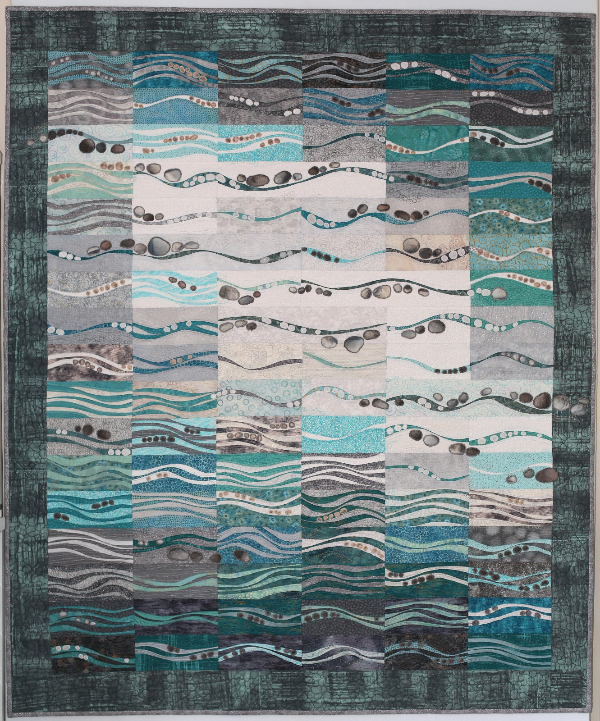 This year’s theme is WATER, so Carol the owner of Loving Stitches in Fayetteville, NC thought of my waves and seascapes and asked me to design a row pattern for her store to hand out during the shop hop. I had so much fun designing my row that I have directions for two different color-ways…daytime and sunset. (Each row measures 9 1/2" x 36 1/2"). To be eligible to get this free pattern, you must physically show up at the store from June 21 – Sept. 8, 2015. Visiting the store in person may be impossible for some of you, so the good news is that the pattern will be available to purchase AFTER the Row by Row Experience from the store or me. The store will have the extra bonus of offering fabric kits. A fractured wrist from a hike on a Monday didn’t stop me from my trip to Indiana on the following Thursday to teach for the Quilter’s Guild of Indianapolis! Hoosier hospitality was at its best. The guild members took such good care of me and were understanding and patient as I did my demos a little awkwardly. 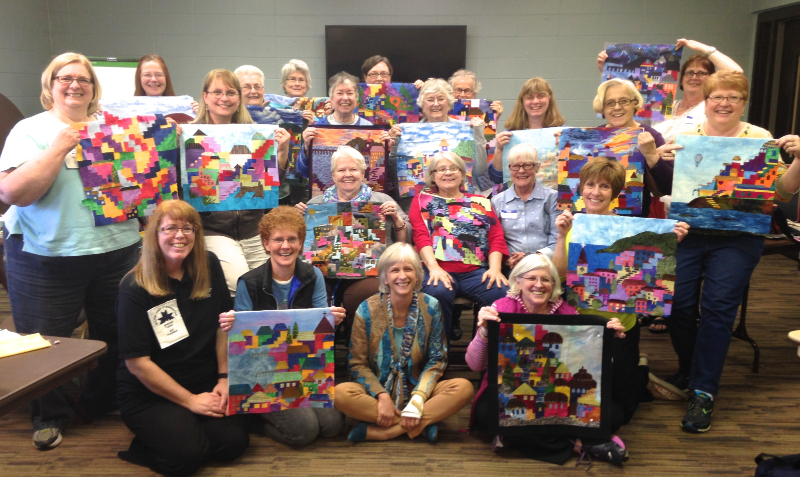 Above is the group shot from the Happy Villages fabric collage workshop. Such cute little towns and happy people! 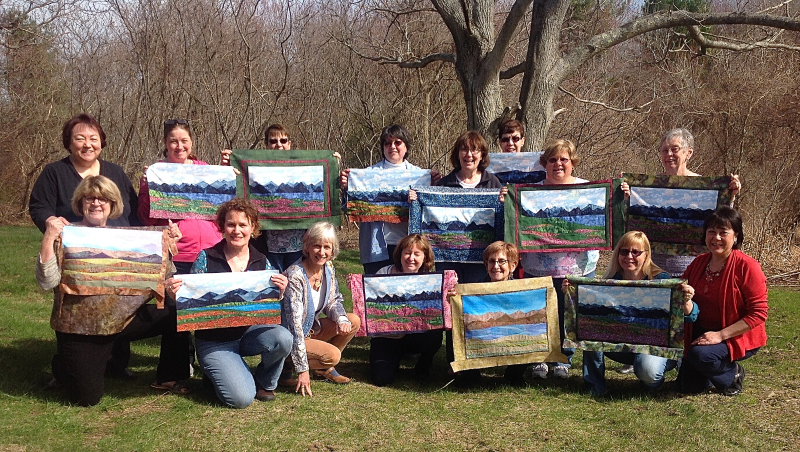 I also taught a full day Accidental Landscapes: Mountain Views workshop. Although I didn’t get a group shot from that class I have this wonderful photo of Grace Holland and me. She showed up to class in her Wearable Waves jacket and a Halloween Village that she had made earlier. Here we are together modeling our jackets and holding her Halloweenville. Boo! 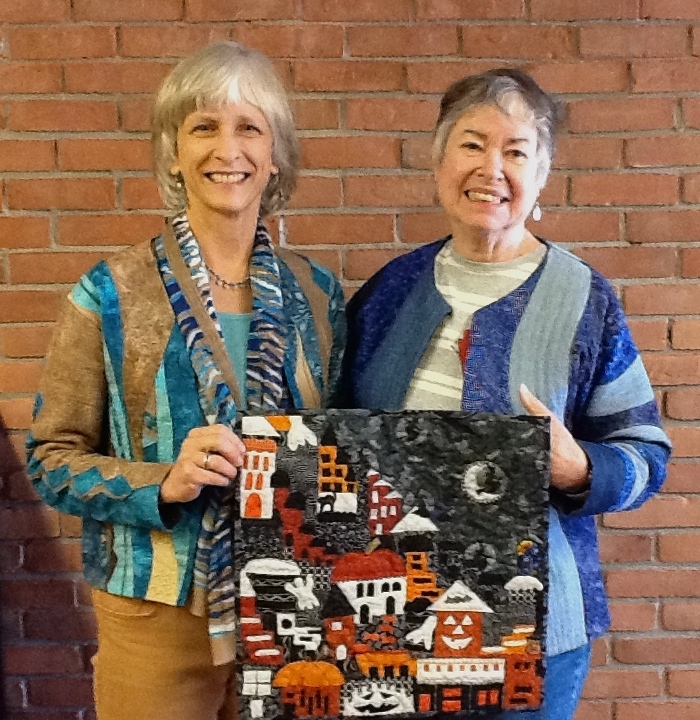 Other teaching trips included two guilds in Massachusetts and a return visit to teach two workshops for my friends Linda and Helen, the sister-owners of the Red Barn Yarn and Sewing Center in Merrimac, Massachusetts. This is our Meadow and Mountains Accidental Landscape workshop. Aren’t they beautiful?......the landscapes are pretty too! “River Stones,” 48” x 58” is now finished…one week before I fractured my wrist. Good timing! I had to laugh when I was basting this piece, because the stones look a lot like the keys on my flute. Check out the photo above. Isn’t that funny? Since quilting is my passion, hobby and business, I decided that I needed to find another hobby to stretch my horizons. So I started flute lessons last September and am loving the challenge! 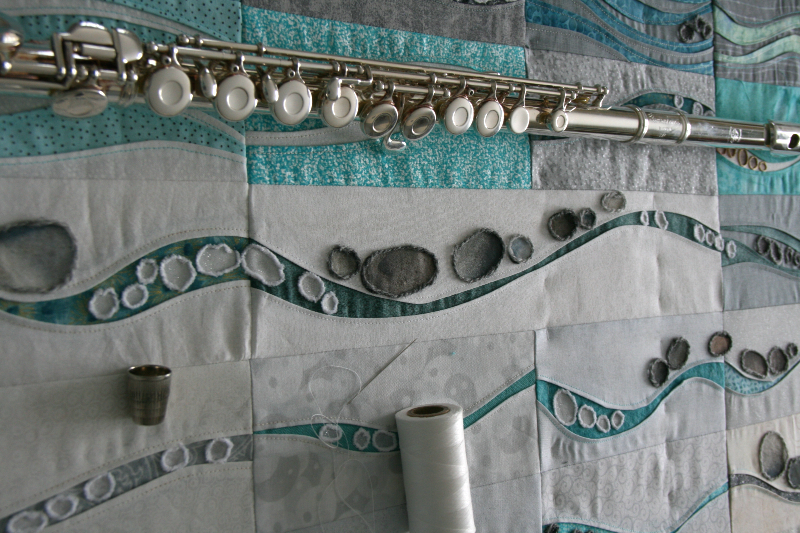 I’m sure there will be a few flute quilts in my future! 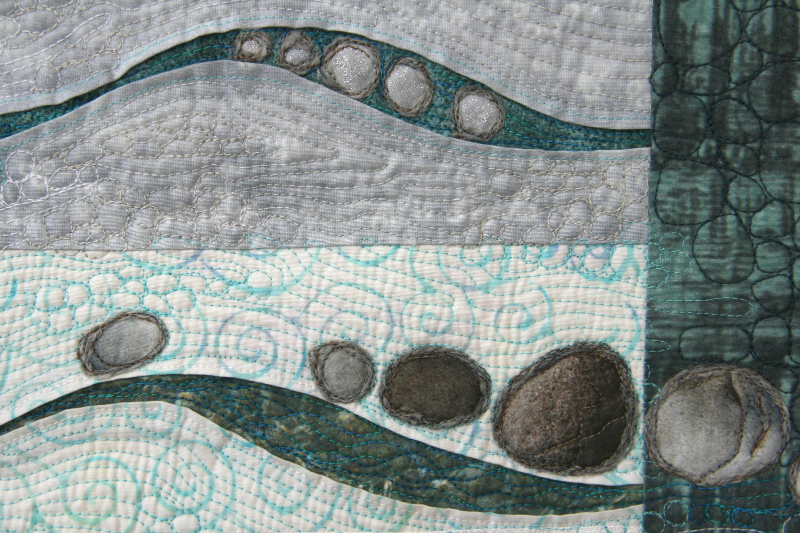 Back to “River Stones"….for some reason I decided to create the challenge for myself of trying to capture the organic flow of a river in the confines of a grid. My husband still doesn’t understand why I made it so difficult for myself, when I could have simply cut and topstitched flowing lines…..that would have been too predictable for me. I’m happy with the meditative feel of the piece and how I was able to use my Layered Waves river (aka ribbon) approach to create each section. Some of the stones are photos taken on our recent trip to New Zealand. The images were transferred to fabric and couched with yarn. Very soon I will be getting the delivery of a brand new BERNINA 770 QE, which will be a huge step up for me from my little non-computerized BERNINA 1031 from 1997. 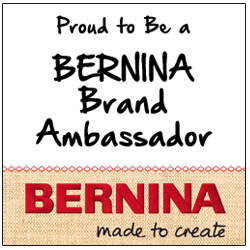 Being accepted into the BERNINA Ambassador program is a real honor. I will have the new machine on loan for a full year to check it out. During that time you will all profit from blog projects/tips that I will write for the WeAllSew blog and classes I will teach at Pins and Needles in Mt. Kisco, NY. Here is the link that has lots of great tips no matter which sewing machine you use. 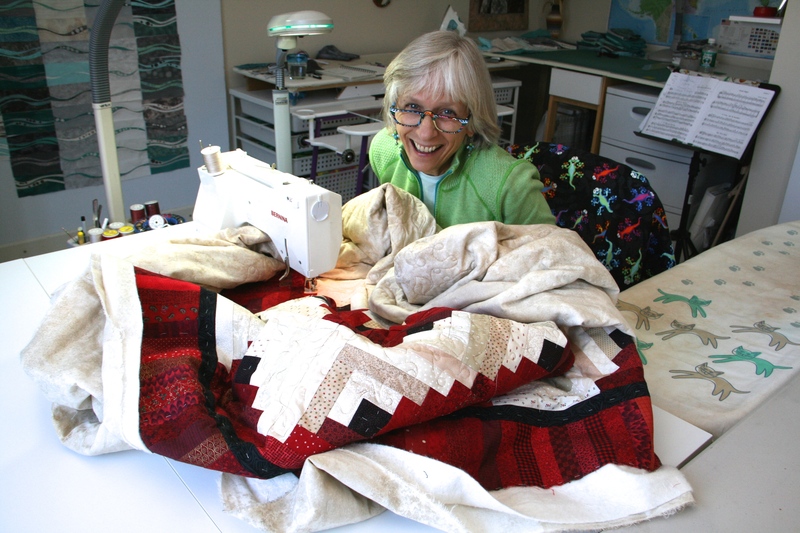 Here I am machine quilting our local library’s raffle quilt (Kent Memorial Library, Kent CT), “Home & Hearth”, with my little BERNINA 1031. It was a struggle, but I won. I will be much happier with the new machine that has a wider and higher throat for stitching larger quilts. The raffle drawing will be October 24, 2015. Tickets are $1 each and can be purchased at the library or by sending a self-addressed stamped envelope to: Kent Memorial Library Quilt Raffle, PO Box 127, Kent, CT 06757 and the raffle stubs will be sent back to you. Here’s a link to the beginning of an interview with me by Superior Threads. I am such a fan of their threads, especially the King Tut series. Check out their site and Facebook page for specials and education. I look forward to meeting many of you this year at workshops and re-connecting with others. 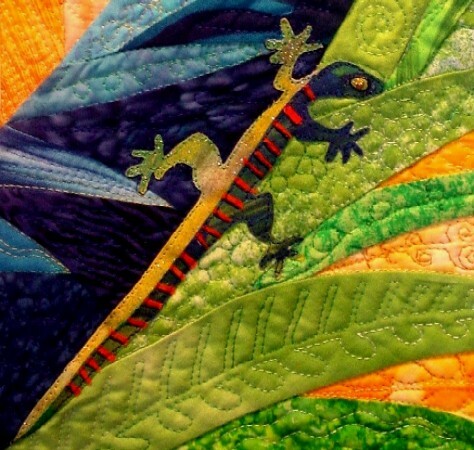 Workshops have now been selected for the Dutchess Heritage Quilt Show, Poughkeepsie, NY, the International Quilt Festival in Houston, TX, the Pacific International Quilt Festival in Santa Clara, CA. The latter two events have the East and West coasts covered for this Fall. Hope to see you at one of them!